The more the film’s title gets examined and picked apart, though, the more the essence of the actual words gets confused (or perhaps the words reveal themselves to be loosely defined and confusing). “Now” and “then” refer pretty much irreducibly to time, especially its passing, but “right” and “wrong” can’t be captured with such brevity. 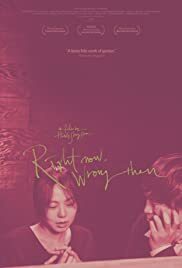 Right Now, Wrong Then is primarily about what others perceive as right and wrong in terms of behavior and speech. The film’s protagonist is Chun-soo (Jung Jae-young), a filmmaker who arrives in the Korean town Suwon a day before he is supposed to speak and screen his latest film at a local festival. While sitting in a blessing hall on his downtime, he introduces himself to Hee-jung (Kim Min-hee), a young woman who’s heard of him, but hasn’t seen any of his movies. The two get coffee and she talks about her routine as a painter — she claims she must paint everyday to express her feelings, otherwise she feels as though she’s failed herself. When Chun-soo speaks it is to deliver forced admiration and platitudes, such as when he says he envies her ability to stick to such a solid routine because he can’t relate to her lifestyle. He then goes to her studio and watches her paint while praising her work, admiring her ostensible sensitivity and willingness to start something without a projected end result. Hee-jung then invites him to a café to meet some of her friends, one of whom happens to be a major fan of Chun-soo’s films.When Hee-jung tells her friend what Chun-soo said about her painting, she reveals she heard him say the same thing verbatim in an interview. Additionally, she spills that he has a wife and kids in Seoul. Upon this revelation, Hee-jung loses interest and goes home alone. The story then starts over from the beginning with some major differences, most notably that Chun-soo is much more upfront about his life (and his opinion on her painting) than he was in the tale’s first incarnation. The result at the end is a much more pleasant parting with Hee-jung and a much more agreeable disposition for Chun-soo overall.